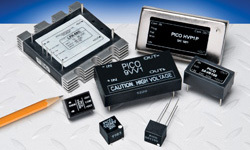 Pico Electronics, the leader in high quality, high reliability miniature power components, offers a full line of high quality, high reliability Ultra Miniature DC-DC Converters from 2V to 10,000VDC Outputs, and 1 Watt to 300 Watt Modules. Ultra-miniature sizes from 0.5” x 0.5” x 0.2” as well as Surface Mount and Thru-Hole. Custom models available. Made in the USA.